I think it is an appropriate moment to consider at P’s homeland as we approach Blizzcon and the almost certainly of the new Expansion’s reveal. I’m well aware that with the scope of Warcraft, it is often difficult to tell everybody’s story simultaneously. That means that while we are wound into the intrigue of the Trolls, or we help Anduin in his tasks, the other factions remain static. In the ‘real’ world this wouldn’t happen, time would march on, but not so in Azeroth. Moments are trapped in amber, the past remaining the present until the designers decide that will change. If we’re lucky, our favourite storylines might get closure. For the Dwarves, that moment might not be far in coming. When you complete the ‘Blood in the Snow’ Scenario in 5.3 you’ll be aware that Ironforge is currently being ruled by a trio of Dwarven houses who make up the Council of the Three Hammers. The mutual distrust between Bronzebeards and Wildhammers of Moira Thaurissan, legitimate heir of the throne and de facto leader of the Dark Irons, leads to Moira pledging herself to the Alliance’s cause, and uniting the three clans for the first time since they were installed as leaders. This is well-timed, when you consider what happened to Ironforge’s previous ruler, and how the Titans yet again have a part to play in events shaping Azeroth’s future. Considering we are now aware the Mogu, like the Dwarves, began their lives as beings of stone, the relevance of the tablet Brann Bronzebeard bought back from Ulduar all those expansions ago suddenly has a more pressing relevance. 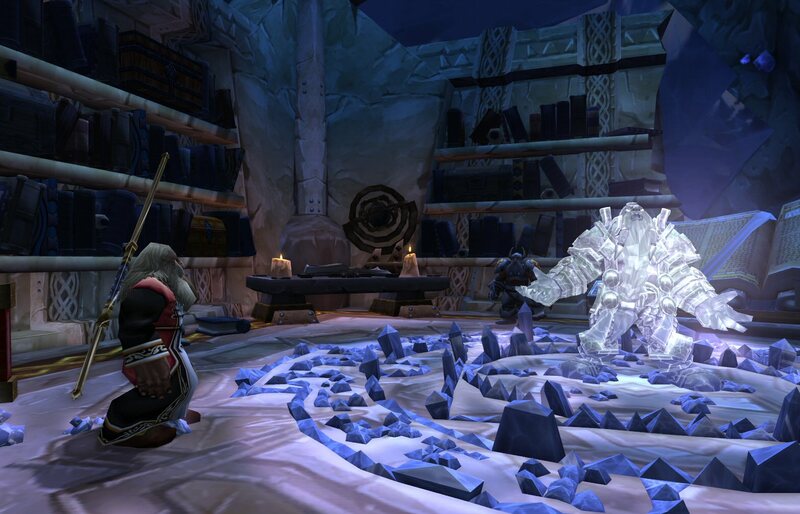 Magni Bronzebeard remains beneath the surface of Ironforge, petrified in an ancient ritual undertaken before the events of Cataclysm, assumed dead (and even given a burial in the novelisation of The Shattering.) He is a static reminder of what transpired before Deathwing’s arrival, but his entombment has relevance in light of current events. This was a king who undertook a Titan ritual to commune directly with the earth itself, drinking a potion to activate the Ulduar tablet and use the old tongue of the Earthen. We see in the ‘Dark Heart of the Mogu’ Scenario just what Titan technology is capable of, that it can alter flesh as well as creating new life. What is to say Magni is really dead? Perhaps he is being ‘re-engineered’, as is the Titan’s wont, for an entirely different purpose? When the winds scream and the stones shudder, the mountain king shall look to the earth for reasons why. He shall taste the soil beneath his feet and ask its advice in a tongue no longer his own. In reply, he shall be made one with his past and transformed into a paragon among mere stone. Interesting use of the word ‘Paragon’ there, especially when we look to the Klaxxi as examples of beings referred to in the exact same way that were buried in amber, waiting for the moment they would be re-awakened when needed. I can’t help but wonder, is Magni really dead, or has he been preserved for a reason, to be re-activated by the Titans themselves if required in an emergency? You know, like some nameless terror rising from the dark below us? In Charge of the Aspects, earth-bending Thrall spots transcended-spirit Magni keeping watch over Khaz Modan. My mind took a dark turn and I imagined that Magni might in the future become a raid boss in his own right. Kinda like a hairy Stay-puft Marshmallow Man rampaging around in front of the bank, stomping on all the little steam-powered tonks that Father Winter (currently cowering in the back of the bank) had been handing out to all the good little Dwarven boys and girls. The three rulers of Ironforge must strap unlicensed Aracane reactors to their backs and detoxify the rampaging king, with help from 10 or 25 of their heroic friends, by hosing him with purple beams of magic, taking care, of course, not to cross the streams. He would have been fine except for the dark mutterings he heard as he slumbered. Only this time, ala John Spartan, he had this uncontrollable urge to knit when he was finally detoxified.